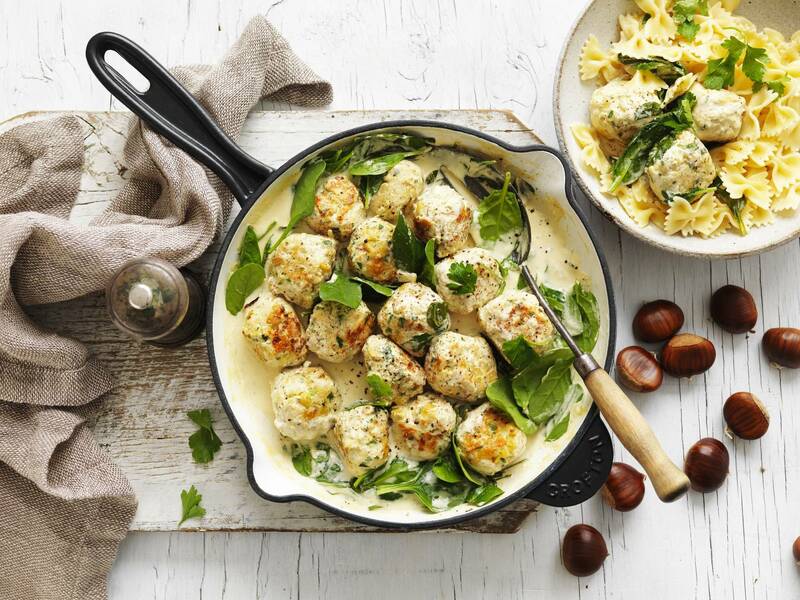 To make the meatballs, combine chestnuts, chicken, onion, garlic, lemon zest, egg and parsley in a large bowl. Mix until well combined. Roll mixture into 18 meatballs. Place onto a tray, cover and chill for 20 minutes. Heat oil in a large non-stick frying pan over medium-high heat. Add meatballs and cook, turning often, for 5 minutes until evenly browned. Remove meatballs from pan and set aside. Add wine to pan and cook for 1 minute. Stir in stock, mustard and sour cream until well combined. Add meatballs to pan. Reduce heat to medium-low, cover and simmer, stirring occasionally, for 8-12 minutes until meatballs are cooked through. Toss through spinach. Season to taste. Serve with pasta, mashed potatoes or rice.